Seven year old Brayden, a second grader from San Diego and the son of a service member, recently coordinated efforts for he and his classmates to draw pictures and send letters to troops in Afghanistan. “I am thankful for them helping our country. We want them to know we are thinking of them,” said Brayden. Brayden got in touch with Freedom Alliance staff member Jennifer Ohman who was preparing to send 225 pounds of coffee to Afghanistan. After getting permission from his teachers the letters and pictures were included in the coffee care packages. 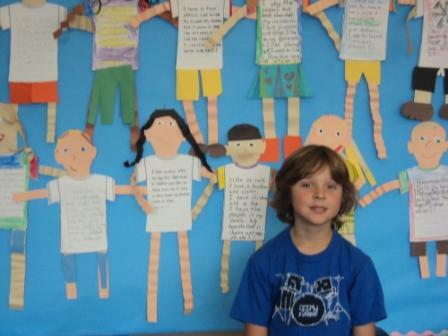 “I think writing letters to the soldiers makes them think of home,” said Brayden. Freedom Alliance’s “Gifts from Home” care package project has shipped more than 2,000 care packages to deployed service members this year. After coordinating with volunteers from all over the country who prepare the packages, Freedom Alliance pays for the postage and shipping. The coffee sent with Brayden’s notes were provided by Borders Books and Music in Visalia, California. Freedom Alliance “Gifts from Home” usually contain the most-requested and needed items, such as prepaid international calling cards, candy, toiletries, games, and non-perishable food items. “It is our hope that the items sent will make life spent thousands of miles from friends and loved ones a little easier to bear,” says Freedom Alliance. The “Gifts from Home” care package project is just one component of Freedom Alliances’ support for service members. They also sponsor Troop Appreciation Dinners, lunches, vacations, family fun days and more.